I incorrectly thought that to get your body from A to B required the same amount of energy whether you walked or ran. That’s not quite true. More correctly if you RUN AT ANY SPEED from A to B then you will use up roughly the same amount of calories. 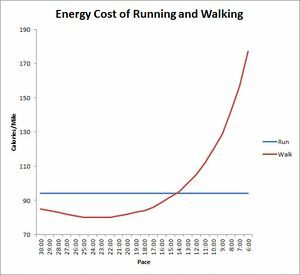 Walking is clearly biomechanically different to running and the energy cost is different to that of running for either a given distance or a given speed. Here is a short and interesting article for fellrnr with a calculator where you can input your own weight. To cover a certain distance, A to B, it’s nearly always easier (ie will consume less energy) if you walk. HOWEVER. Here’s the interesting bit. At around 8 miles per hour it becomes MUCH more energy-consuming to walk fast rather than to run fast. But 8 mph is a very fast walk. So what does this all mean for weight loss? If you are running and trying to lose weight then you are more likely to be over-weight. The faster you run and the heavier you are (I would contend) then the more likely you are to get injured – then you can’t run at all for while. Therefore run slow. BUT, whilst running slow, try to think of distances rather than speed and try to increase the distances you run rather than the speed you run. THAT STRATEGY WILL likely be the most effective, longer term, to burn the most calories. It does not matter how slow you run. But it DOES matter how far you run. When you are walking (or running aerobically) then you are specifically telling your body to get better at burning fat as a fuel source. If you run fast then you are still burning fat but you are also getting much better at burning carbs -that’s fine for getting faster but maybe, simplistically, not so good for burning fat. Factette: About 90% of the energy to race a 5k comes from fat burning. But don’t forget the other 10% is important to train for. The whole picture is more complex than that. But that’s good enough for now. I could comprehend that running from A to B requires same amount of energy regardless of pace. But I don’t think it’s that simple overall. I would imagine this applies only to the activity itself! But if You take into consideration overall impact on Your body, including recovery period after the workout, I think it’s pretty safe to say that faster paces will impact/”damage” Your body more. This means more recovery time required, which means more calories. That’s why HIIT vs steady effort is considered more effective in burning calories, correct? The 101 article was aimed more at people who are trying to lose weight through either running/walking, for them it’s best not to run too fast. fellrnr’s article is a nice, short read. yes it’s complex. But is fitness just about losing weight/burning calories? HIIT will likely raise your VO2max. If you are poor biomechanically and overweight then I’ve seen lots of people get injured with HIIT. there are also issues around individual response to training types (see dnafit.com). people do argue it both ways. a simple thing I would suggest doing is look at your 10k/hm Pb and 5k pb and them compare then in a running calculator if your 10k/hm PB is higher than it should be (often true for a LOT of casual runners) then your aerobic base needs work.